Piso Fare 2019 Promos Until 2020: Piso Fare Promo Cebu to Tandag is here! 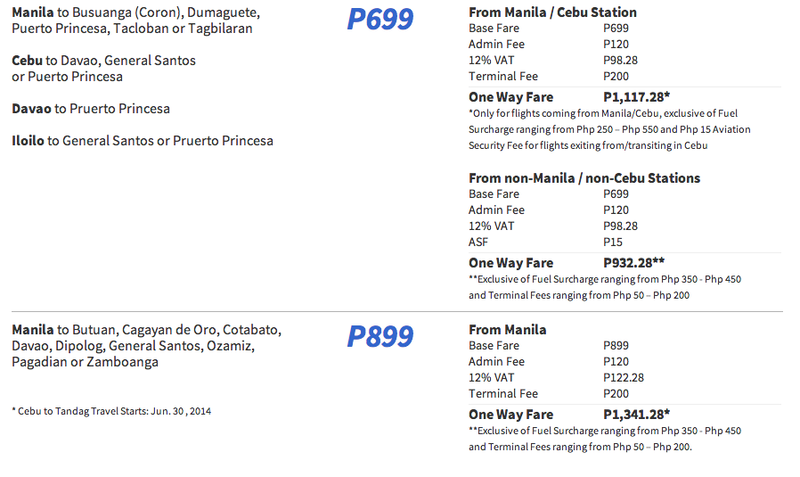 Piso Fare Promo 2014, 2015, 2016: Piso fare to the new route of Cebu Pacific, Cebu to Tandag! So better grab this chance to visit Surigao del Sur! 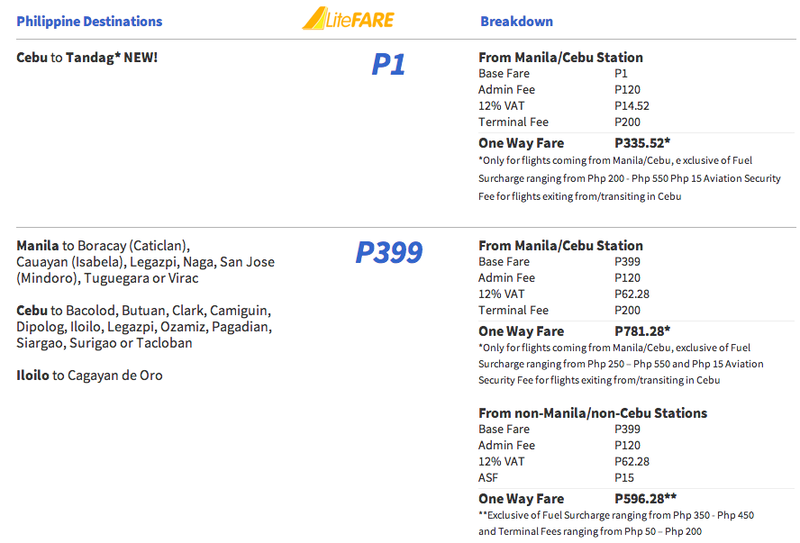 Avail this Php 1 fare promo! While other domestic and international flights are also on promo seat sale! Check below! #CEBseatsale ! 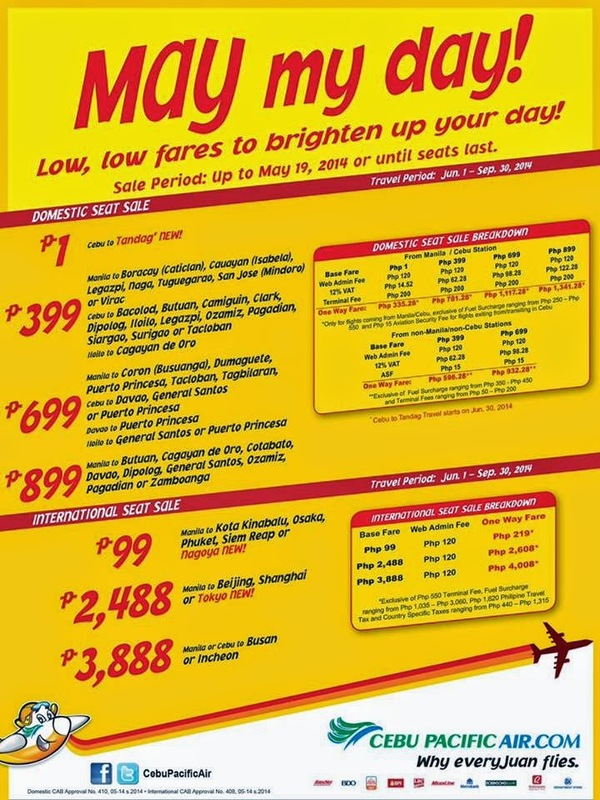 Quoted DOMESTIC one way fares are inclusive of Base Fare, Php 120 Web Admin Fee, 12% VAT, Php 200 Terminal Fee for flights transiting in or exiting from Manila/Cebu Station and 7 kg hand-carry baggage allowance, but exclusive of Fuel Surcharge ranging from Php 250 – Php 550, Php 15 Aviation Security Fee for flights coming from Cebu and check–in baggage. Terminal Fees ranging from Php 50 – Php 200 for flights originating from non-Manila/non-Cebu Stations must be paid at the airport. Quoted TERNATIONAL one way fares are inclusive of Base Fare, Php 120 Web Admin Fee, and 7 kg hand-carry baggage allowance but exclusive of Php 550 International Terminal Fees, Php 1,620 Philippine Travel Tax, Fuel Surcharge ranging from Php 1,035 – Php 3,060, Country Specific Taxes Php 440 – Php 1,315 and check-in baggage. Promo fares have limited availability and are non-refundable but rebookable subject to the following rebooking fees: Php 1,200 for Domestic destinations and Php 2,000 for Short-haul International destinations plus fare difference. Please note that booking fee rates range from Php 120 –Php 200 depending on purchase channel. For your convenience, flight changes, availing of prepaid baggage allowance for check-in baggage and web check-in service can be done up to 4-hours before scheduled flight. AVAILABLE NUMBER OF SEATS ON-SALE PER ROUTE and v.v. DOMESTIC: MANILA TO: Butuan: 18,720; Busuanga: 2,980; Cagayan de Oro: 50,010; Caticlan: 9,030; Cauayan: 1,080; Cotabato: 6,430; Davao: 68,990; Dipolog: 5,580; Dumaguete: 6,220; General Santos: 14,070; Legazpi: 19,880; Naga: 2,550; Ozamiz: 2,610; Pagadian: 5,370; Puerto Princesa: 10,670; San Jose: 5,320; Tacloban: 23,440; Tagbilaran: 2,900; Tuguegarao: 6,970; Virac: 60; Zamboanga: 18,050 . CEBU TO: Bacolod: 15,820; Butuan: 6,450; Camiguin: 3,010; Clark: 2,320; Davao: 21,500; Dipolog: 2,990; General Santos: 4,010; Iloilo: 10,440; Legazpi: 1,540; Ozamiz: 2,480; Pagadian: 1,800; Puerto Princesa: 4,140; Siargao: 2,190; Surigao: 6,810; Tacloban: 16,620; Tandag: 805; DAVAO TO: Puerto Princesa: 40. ILOILO TO: Cagayan de Oro: 3,640; General Santos: 2,560; Puerto Princesa: 1,770 and v.v. INTERNATIONAL: MANILA TO: Busan: 1,660; Beijing: 1,290; Incheon: 12,490; Kota Kinabalu: 2,940; Nagoya: 3,640; Narita: 7,330; Osaka: 3,740; Phuket: 1,210; Shanghai: 4,250; Siem Reap: 2,420. CEBU TO: Busan: 530; Incheon: 3,170 and v .v.